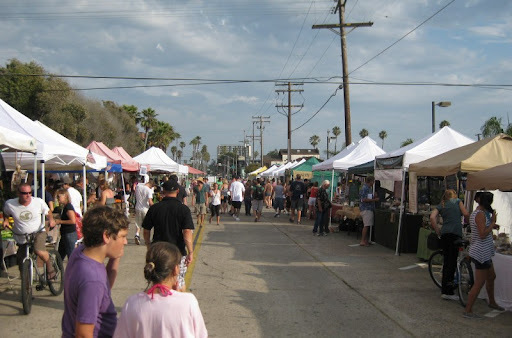 Yesterday was the first day of the new Tuesday afternoon Farmers' Market in Pacific Beach. Operated by the same people who run the Little Italy market, the new PB market runs from 2:00 to 6:30 every Tuesday during the summer months. It is located on Bayard Street between Garnet and Hornblend. The bulk of the market space is taken up by vendors selling prepared foods and crafts, but there are still enough produce vendors to cover the basics. A stand run by relatives of one of our favorite vendors from the Saturday morning market, Maciel Family Farm, is there and Suzie's Farm has a stall. Son Rise Ranch is on hand selling beef and pork (and chicken if you order it ahead). Overall, the new market is a nice addition to PB. I think we'll stick with the Saturday market for the most part, but it will be good to have a second option. Good to know SonRise has a booth since I get my leaf fat from them. We'll definitely give Son Rise a try. We get beef from Brandt at the Saturday market, but I'm interested in trying their pork and chicken.